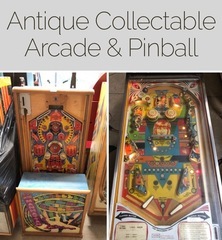 M21863 Coin Operated Amusements – Rare and retro pinball, table game, arcade, entertainment equipment. AUCTION CLOSING DATE: Friday, October 19th, at 11:07 am. Bidding closes on the first item at 11:07 am, then closes at the rate discussed in these Terms and Conditions of Sale.